Sarah Nader- snader@shawmedia.com Senior Airman Jared Burton gives a shot speech during a welcome home celebration for Burton to celebrate the end of his active duty in the Air Force Thursday, July 3, 2014 at the Woodstock Moose Lodge. Burton joined the Air Force in 2008, was deployed to Afghanistan from June 2011 through January 2012 and Kuwait from November 2012 through May 2013. He plans on staying in the Air Force reserves while going to school to become a firefighter and paramedic. 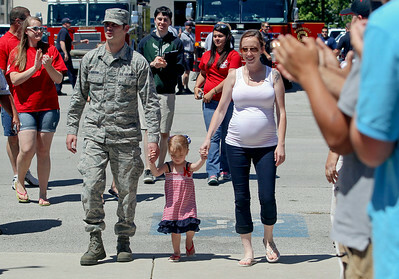 Sarah Nader- snader@shawmedia.com Senior Airman Jared Burton walks with his daughter, Colbie Burton, 2, and wife, Katy Burton, during a welcome home celebration for Burton to celebrate the end of his active duty in the Air Force Thursday, July 3, 2014 at the Woodstock Moose Lodge. Burton joined the Air Force in 2008, was deployed to Afghanistan from June 2011 through January 2012 and Kuwait from November 2012 through May 2013. He plans on staying in the Air Force reserves while going to school to become a firefighter and paramedic. 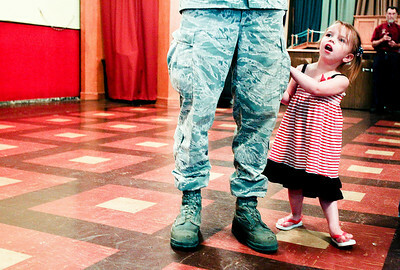 Sarah Nader- snader@shawmedia.com Colbie Burton, 2, of Harvard holds on to her father, Senior Airman Jared Burton, during a welcome home celebration for Burton to celebrate the end of his active duty in the Air Force Thursday, July 3, 2014 at the Woodstock Moose Lodge. Burton joined the Air Force in 2008, was deployed to Afghanistan from June 2011 through January 2012 and Kuwait from November 2012 through May 2013. 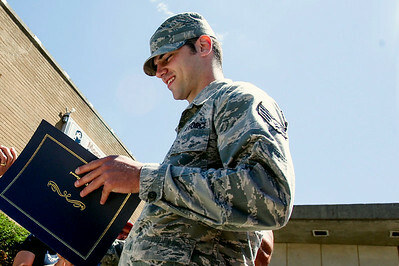 He plans on staying in the Air Force reserves while going to school to become a firefighter and paramedic.